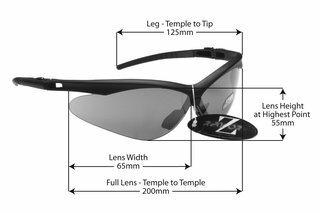 Home All RayZor Sunglasses Rimless Sunglasses WINDSHIELDZ: RAYZOR DARK RED FRAMED SPORTS SUNGLASSES WITH A RED IRIDIUM MIRRORED ANTI GLARE LENS. Lightweight Dark Red Frames Manufactured from a Shatterproof Polycarbonate Compound, With Black Rubber Head Grips and Black Rubber Nose Pads. Ideal for sports, cuts glare but on duller days, brightens everything up. Did everything I needed them for, very good. WINDSHIELDZ: RAYZOR BLACK FRAMED SPORTS SUNGLASSES WITH A BLUE / GREEN IRIDIUM MIRRORED ANTI GLARE LENS.